For nearly one hundred years, musicians have been using silver coin picks on their stringed instruments because of the unique and pristine 'silver-tone' they produce. 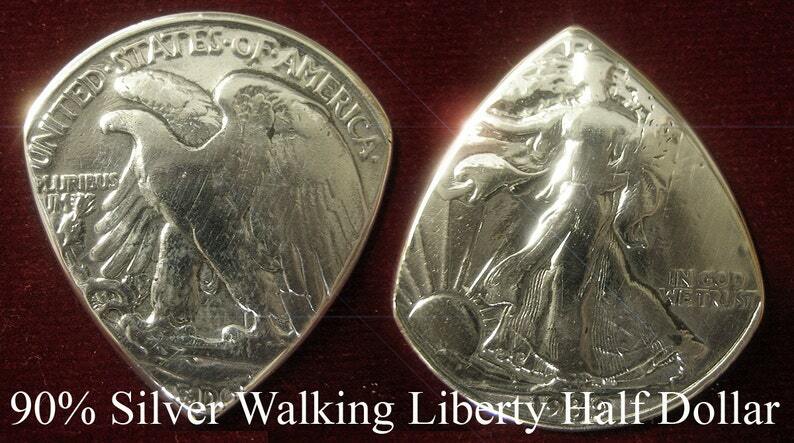 Now here's your chance to own one of these rare silver coin half-dollar picks. An excellent silver coin pick for recording those intimate sessions or jamming with the band! 1940-1964 YEAR & STATE Gift Set of 2 USA Coin Guitar Picks - The perfect personalized men's and women's gift for any musician! This little quarter pick came super fast and is perfect. I will be giving it to my husband later this month on his birthday and I know he will love it as much as I do! Thank you for the prompt shipping and beautiful workmanship. I can't wait to gift this to my brother for his birthday! Perfect & super fast service even for an older year. We understand that some people only want to pay for things in certain ways. So, we always accept Paypal, Money Orders, Personal Checks, Foldin' Money, Goats & Chickens. Our refund policy is simple - you either love it, or your money back. Lifetime guarantee on all products. We ship every order with USPS first class with delivery confirmation unless otherwise specified. All orders normally deliver within 10 business days of payment. Expedited shipping is available for $12 - contact us immediately if you need your order fast. YEAR & STATE Gift Set of 2 USA Coin Guitar Picks ... The perfect personalized men's and women's gift for your guitarist this year!